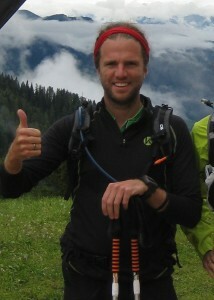 Thomas Kjerstein from Denmark joined „motivated by nature“ after the Trailruncamp in the Dolomites in July 2011. Running is simply a large part of my life and who I am. Years ago I started by running a few kilometres just to lose some weight. But as most runners will agree, running quickly becomes more than moving your shoes and legs, it moves your mind! I realised that I was beginning to like the feeling of using my body and liked the results in my head. My thoughts became more positive and I started to belive I could do more – do more running and in my general life. It is important to me to focus on a good life and I have realised that by running I´m enjoying life much more. I run to be a great dad, a great husband, a great teacher and just to be happy about who I have chosen to be. Back to running: Friends took me to longer runs and I started running half-marathons. Soon I wondered if I could manage the whole distance – 42 KM. I could! This year I have finished 7 marathons and will – hopefully – finish one more in August before we go to the Transalpine Run. I´m not a fast runner and my physical shape could be stronger – but I love running and my endurance comes directly from my heart and head. There is no doubt that the Transalpine Run is a mind – and body – blowing task waiting for me. I think about it all the time wondering if I can do it – that´s actually how I like it. Mind mind and body is going to meet yet another challenge. Life is great! VUMB 2015 – VUMB INDTAGER SJÆLLAND! Løbeplaner 2015 – et udkast!